Apparently I am simply not going to meet my 2015 New Year’s Resolutions this year, but hey, 2016 is around the corner so I can turn a new leaf. Something I did sort of accomplish is cutting back on my diet soda habit. I love the sweet, fizzy carbonation while I am working, watching TV…pretty much anytime. My fave aspect of diet soda is that it’s fizzy and delicious. So, I’ve slowly incorporated more sparkling water into my life, and it’s been great. I truly do love sparkling water, and I have tried every flavor on store shelves. My biggest gripe about both diet soda and sparkling water is the waste. Living in a rural area, we only have trash pick-up once a week so our trash can space is precious. I hate taking up a ton of space with plastic bottles and cans since there’s no recycling centers nearby. I’d heard of SodaStream products before, but had never taken the plunge. And now I am wondering why I didn’t make the switch sooner! The SodaStream Power Automatic Sparkling Water Maker is FAB. 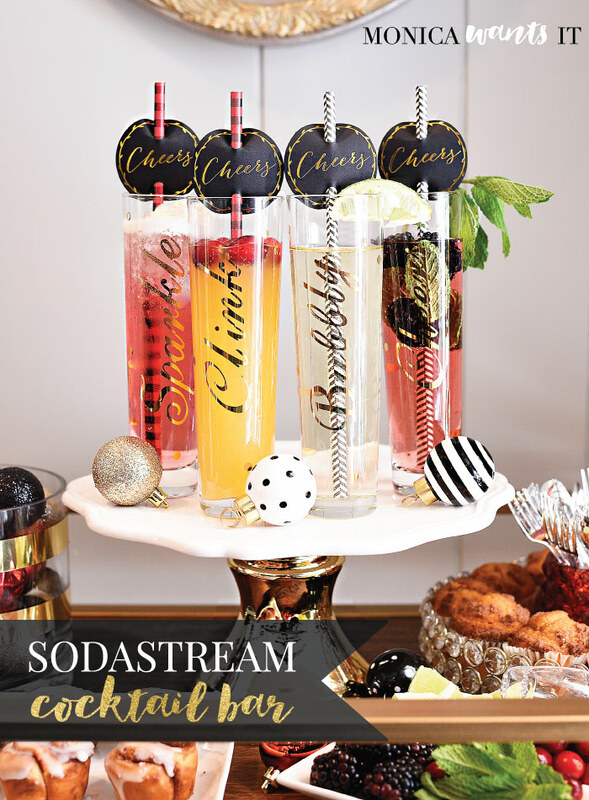 There are tons of SodaStream Sparkling Drink Mixes so you can concoct your own flavors. 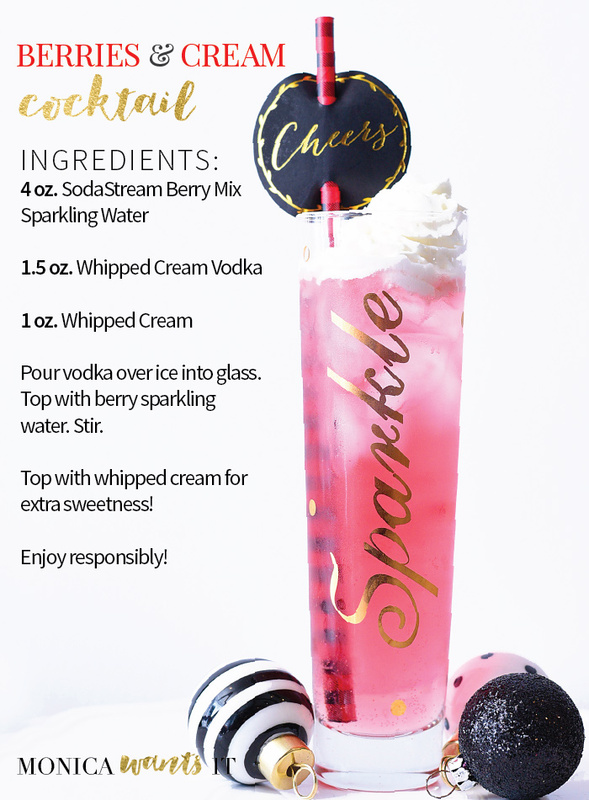 My personal fave are the mixes in the gold bottle– those are gourmet sparkling mixes created by Chef Paul Liebrandt that use fun and unexpected flavor combos such as blackcurrant lime and apple cucumber. I feel like it’s a better choice than soda, especially for diabetics (and yes, they do have mixes without sugar! ), and you can’t beat making your own carbonated/sparkling water with just the touch of a button. It doesn’t take up very much room on my kitchen counter, which is a plus. 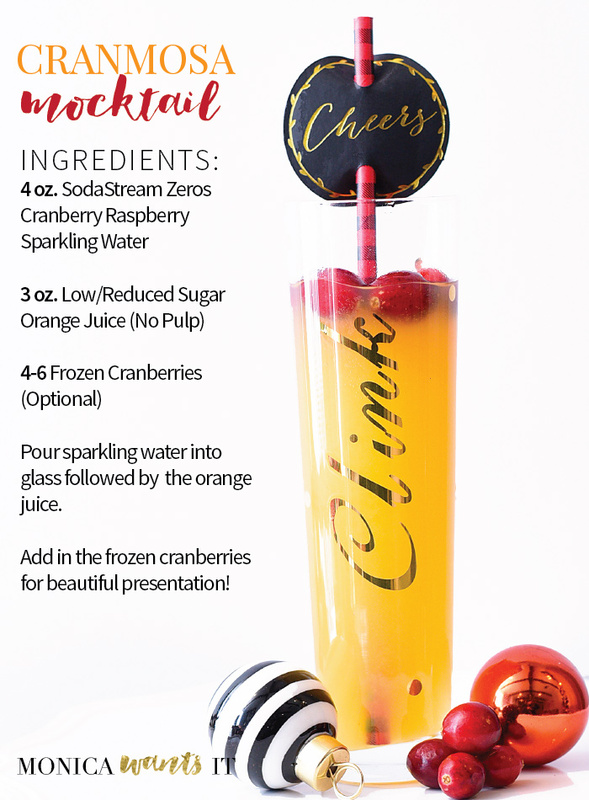 While the flavors are tasty on their own, I’ve been dying for an excuse to do a cute brunch set-up and get creative, so using my SodaStream Power I created two mocktails and two cocktails for you to enjoy! They’re served up in stemless champagne flutes, although you could use whatever glassware you have on hand. Some fun straws from the $1 Spot at Target give them a fancy flair. 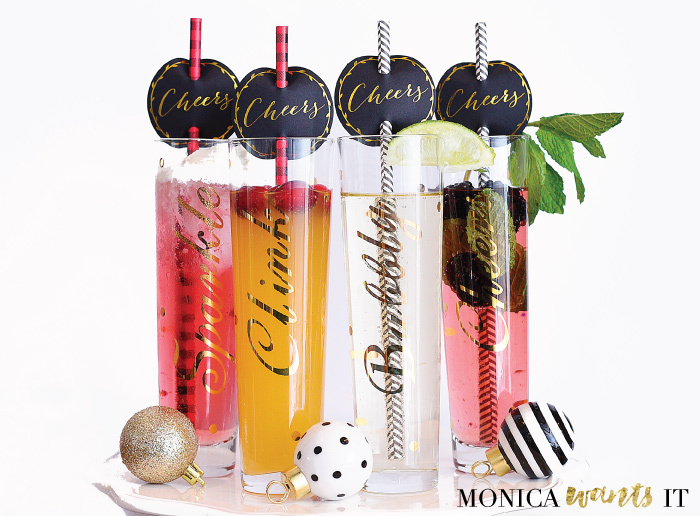 When thinking of flavors to pair with the four sparkling drink mixes I received, I thought of what colors and flavors would make the drinks extra festive and tasty. I finally chose to incorporate fresh lime, blackberries, cranberries and mint leaves. Also making an appearance are moscato wine, whipped cream vodka and reduced sugar orange juice. Let’s get started with the recipes! All the recipes below call for sparkling water flavors that are already made, so it’s literal water ounces, and I used the highest carbonation level (three drops) for extra fizziness. 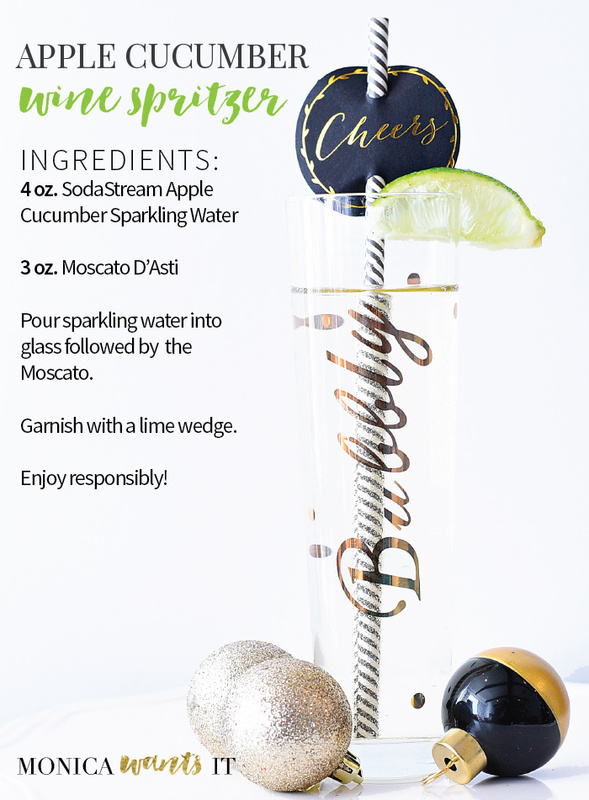 Pour sparkling water into glass followed by the Moscato. Garnish with a lime wedge. Place mint leaves into glass and lightly muddle to release flavor. Top with sparkling water. 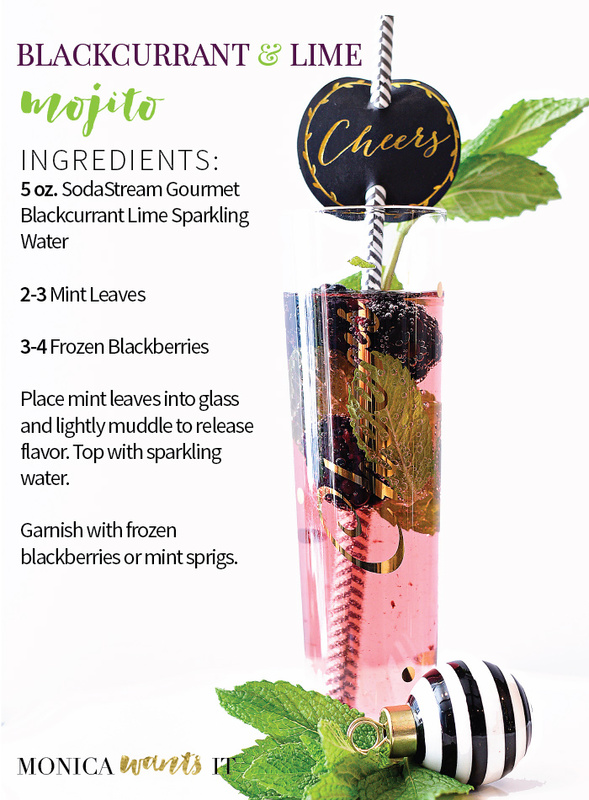 Garnish with frozen blackberries and/or mint sprigs. Pour vodka over ice into glass. Top with berry sparkling water. Stir. Top with whipped cream for extra sweetness! Pour sparkling water into glass followed by the orange juice. Add in the frozen cranberries for beautiful presentation! My favorite part is how beautiful they all look right next to each other. My husband and I taste tested all of these, and they’re all really good. My personal favorite is the berries & cream. He loved the faux-jito the best. This whole little brunch set-up fit on my bar cart, so don’t be afraid to entertain in small spaces. Move some stuff around and invite people over. Tis the season after all. The SodaStream Power would make a wonderful gift for your kitchen or for someone who you know is trying to make better dietary/lifestyle choices. Buy the SodaStream Power online here and receive free shipping. Having the power to whip up your own sparkling water at home in any flavor you can imagine is truly awesome, and I love how sustainable the product is. My only regret is not getting one sooner, but I am totally scouting their website for other flavor mixes so I can kick my diet soda habit for good. What is your vice when it comes to making better lifestyle choices? Hope you enjoyed this post and these recipes. Please share, pin, and comment– your support means the world to me! xoxo. My husband & son love our Soda Stream. I will be making these recipes for them. Thanks for sharing your delicious drinks! Drinks looks delicious! And the pictures are great! I have been wanting a Sodastream for a while now. All those cocktails looks DELICIOUS. I am gonna have to snag me one so I can make them.